FreshAirParty.com has the experience and resources you need when planning an event or party. 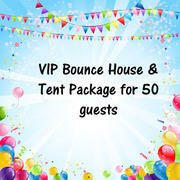 That's why we've put together party packages that have some of our most popular items at a great value. Let us do the heavy lifting and make you the "Party Hero". These package deals are so hot, you need to call us to reserve one! Don't see the specific package you're looking for? Call us at 770-279-2787, and we can create one for you! Browse the selections below and click on the image or "More Info" link for additional information and to make a reservation.